The InLoox PM 8 dashboard provides you with the standard views about all relevant and project-related information to analyze, control and compare your projects. You have always all key data, developments and target values at a glance - up-to-date and clearly designed. Create your personal dashboard with an individual selection of widgets. The dashboard provides you with a graphical overview and lists. Create your personal dashboard. For more information, see Create new dashboard. In this table you find the descriptions of the standard views to monitor the project information. Shows the system-wide all planned expenses and revenues compared with the actual values. The dashboard provides you with different time views - month, quartet and year. This dashboard displays the comparison between the planned and actual percent complete. The planned percent complete is defined as (the sum of the work effort all work packages in the planning (work packages< today)) / (the sum of work effort all work packages in the planning). Represents the analysis of the dates in a project and compares them with the planned data. 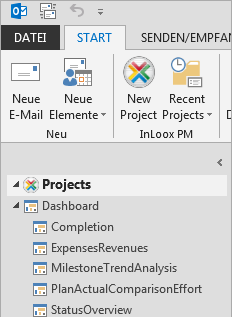 The dashboard visualizes the date delay of the milestone in the project. With this view you can quickly see the deviations from the planned schedule. Shows an overview of the progress and the cost-effectiveness of your projects. Shows planned and actual hours of your projects. Dashboard standard views | InLoox PM 8 • Copyright 1999-2019 © InLoox, Inc. All rights reserved.